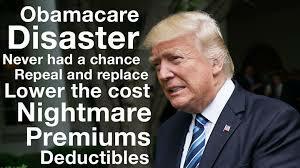 Trump’s attempts to replace Obamacare fail – Royal Times of Nigeria. United States’ President Donald Trump’s efforts to find a replacement for ex- President Barack Obama’s healthcare system have collapsed in the Congress. Two Republican senators said they opposed their party’s proposed alternative, making it impossible for the bill to pass in its current form. President Trump had made repealing and replacing Obamacare, under which more than twenty million people gained healthcare coverage, a key campaign pledge. Republicans view the 2010 legislation as an overreach of the federal government and said patients have less choice and higher premiums. Report says the party’s proposed alternative had kept key Obamacare taxes on the wealthy, while imposing sharp cuts to healthcare for the poor and allowing insurers to offer less coverage.